To join in the fun you don't need to be a trained singer, only able to hold a tune; guidance will be given. All ages welcome, as long as your voice has broken! In addition to the great pleasure of singing in harmony, members, with partners and friends, participate in a robust and active social life. We rehearse from 6.30pm to 8.30pm every Sunday night, and 7.00pm to 8.30pm every Tuesday night in the Parish Church hall, Abbeygreen, Lesmahagow from October through to the end of March, with breaks for Christmas etc. Annual Concert 2018. Once more we wish to thank all our supporters for an excellent turnout at our recent Annual 96th Concert on 8th and 9th of March 2018. All reports suggest that the Choir continue to maintain their usual high standard under Oksana's baton and supported by our accompanist Liam Lees. The artistes, Milton Primary School and our very own Liam Lees. Liam played a selection on the organ as a farewell performance before leaving for America to further his career. 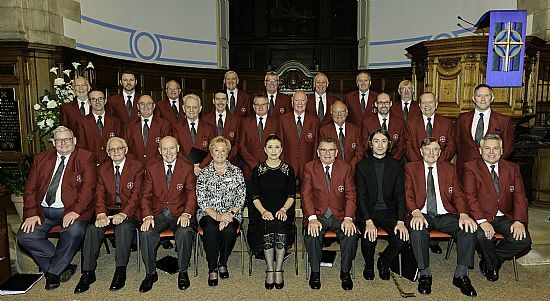 The Choir also performed at the Lanarkshire Massed Male Voice Choirs concert on 23rd March in Hamilton Townhouse. Again our pieces, The Gendarmes, The Banks of Allan Water and Blue Moon were well received. Annual Concert 2017. The Choir's Annual Concert was held on Thursday and Friday 9th and 10th March 2017 in Lesmahagow Old Parish Church. Once again we had an excellent turnout and so far all reports have been very favourable. This year our guests were a music group from Lesmahagow High School and proved very popular. However due to illness one member had to drop out, but at short notice our gifted and popular Conductor, Oksana Mavrodii stepped in, a well-know soprano in her own right, and delighted the audience with two songs which highlighted her wonderful abilities and superb range. She was ably accompanied by the Choir's Accompanist, Liam Lees. Please come along and join us (see below) as we prepare for our 98th concert, in 2020. Invite Us We'd be delighted to sing at your function,either as a full Choir, small group or quartet. Complete the details on our Contact Us page for a discussion and more info. About Us Lesmahagow Male Voice Choir is one of the longest existing organisations in our historic village in Clydesdale Scotland. We have been in existence, uninterupted since 1920, when the Choir was formed to take young men off the streets during a time of high unemployment. We are an amateur group ranging in age from 20 to 70 and beyond!. Our programme changes every year and covers a wide range of pieces, from modern through to classical. Concerts The Choir performs at events for charities, churches, guilds and clubs etc, throughout the local area and beyond. Why not contact us to discuss your requirements. In addition our annual concert is usually held on the Thursday and Friday of the second week in March. We also take part in the annual Festival of Male Voice Choirs in Hamilton and also performed at: the Scottish Massed Male Voice Choirs in the Royal Concert Hall Glasgow; Leonard Cheshire fund raising concerts held in Dumfries; recorded for the BBC with the Scottish Massed Male Voice Choir for a Christmas Eve carol service which was shown before midnight on 24th Dec. 2012.